With trains and subways infusing the station with people at regular intervals, the handsome shopping mall inserted into D.H. Burnham's Beaux-Arts building pulsates with life. This bustling facility serves 50,000 daily Amtrak travelers, Maryland Area Railway Commuter (MARC) riders, Washington Metropolitan Area Transit Authority (WMATA) Metro (subway) and bus riders, tourist bus passengers, taxicabs, office and government workers, and area residents. 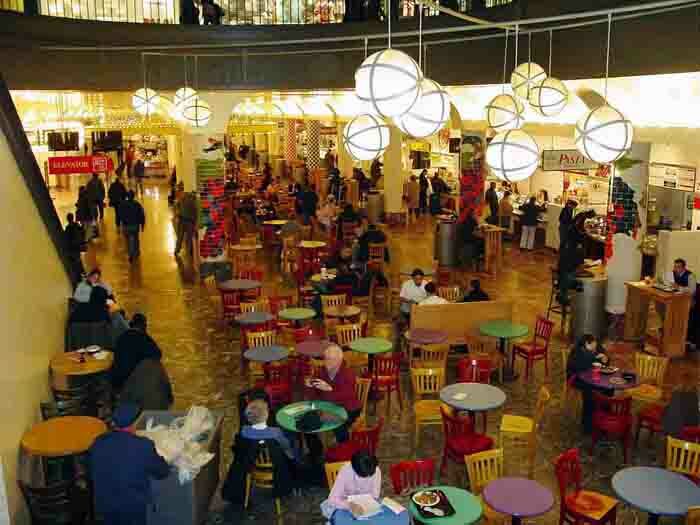 While transit clearly is the essential function and animator of Union Station, the addition of a shopping mall allowed this place to serve also as a central square where neighborhood residents and others could safely go to shop, eat, and meet friends. The grandeur that was once associated with transportation is now appropriate raiment for commerce, too. 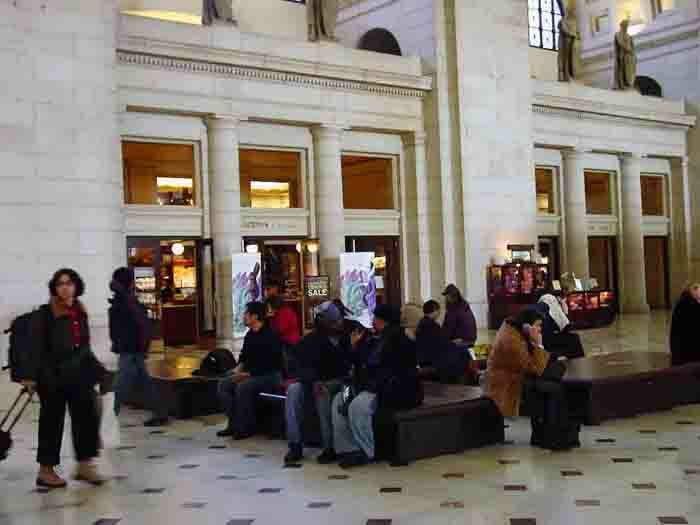 In addition to its main retailers, Union Station provides opportunities for start-up businesses: artists, craftspeople, and "mom and pop" type businesses, several of which are minority enterprises. The station's East Hall is devoted to movable, mahogany counter-height retail kiosks which vendors can lease for 60 days to 12 months, allowing them to try out new merchandise, experiment with marketing, and focus on seasonal products while minimizing financial risk and commitment. Some businesses incubated in the East Hall moved into permanent retail space in the main station area. Between 1,200 and 1,500 new jobs have been created within the station. As a transit station, this place is all about access - however, signage is insufficient at the station, and while it's accessible by car (with 1,400 parking spaces) and train, the bus depot is 1-2 long blocks from the station. Nor is the station well-connected to notable Washington D.C. attractions, as L'Enfant's plan puts it a longish walk from the Capitol and the Mall. A prime example of a historic Beaux-Arts building, whose renovation spurred development in the area (e.g., at the post office across the street, the Thurgood Marshall Judicial Center, and the new office building behind the station). A nine-screen AMC theater complex; Amtrak national headquarters and a station; Metro (Washington D.C. transit system) and MARC (Maryland Area Railroad Commuter) connections; and retail - over 100 specialty shops, a food court and restaurants, as well as shoe repair, pharmacy, car-rental service, florist, ATMs, photo processing, delicatessen, and foreign currency exchange. 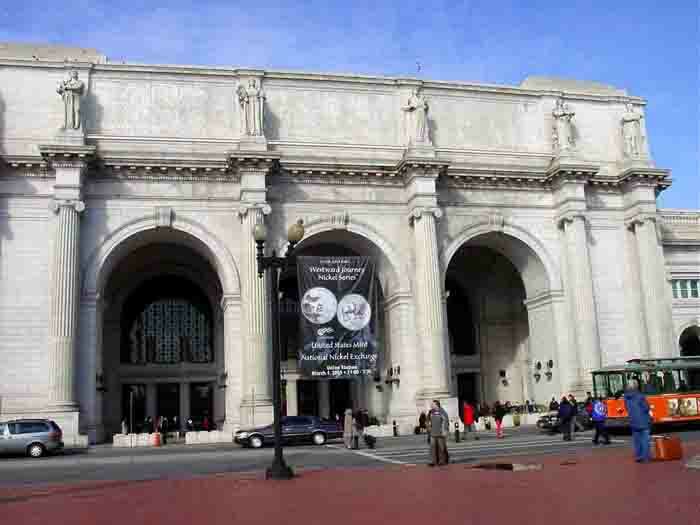 Union Station is now "the" meeting place on Capitol Hill and a symbol of civic pride for Washington D.C. Designed by Daniel H. Burnham (principal architect of the 1893 Chicago World's Fair), Union Station is representative of Beaux-Arts-style architecture and the City Beautiful Movement, which led to the beautification of many urban centers and the addition of grand public buildings. 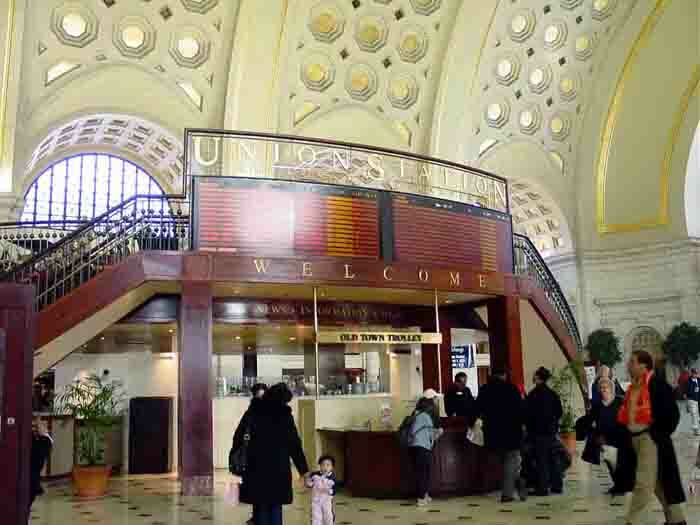 For the first half of the 20th century, Union Station functioned as a center of activity in Washington, complete with a bowling alley, bakery, and a YMCA. The decline of railroad use led to the decline of the station in the 1960s and '70s. In 1968, it was decided the station would transformed into the "National Visitor Center." The project was not completed until 1976 but failed to lure visitors so far away from the Mall and its attractions, and closed by 1978. 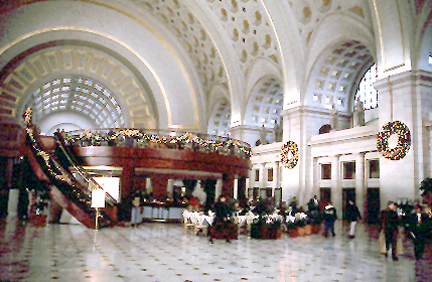 In 1981, redevelopment was initiated by the non-profit Union Station Redevelopment Corporation (USRDC). Construction began in 1985 and was finished in 1988 a total cost of $160 million. 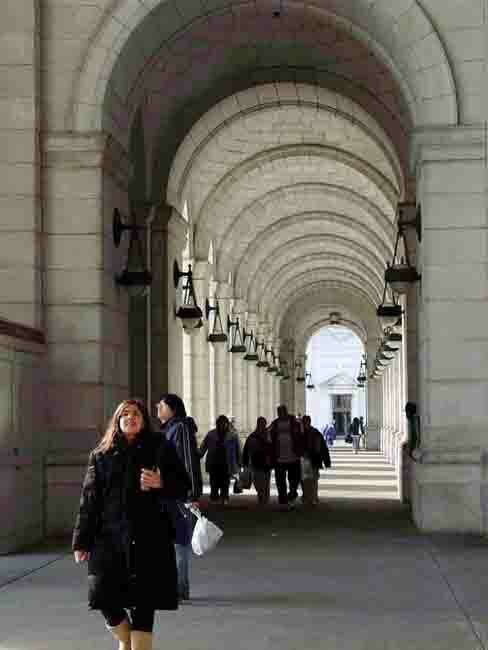 Union Station is owned by the U.S. Department of Transportation and managed by LaSalle Partners, a private with a 99-year lease on the station and the leaseholder for the station's retail tenants. LaSalle replaced the government in handling day-to-day operations of the Station, including maintenance and security. In addition, the management firm sponsors seasonal events and activities; runs an innovative social service referral program for the homeless with free transport to area shelters; and a food donation service between station restaurants and local homeless facilities. 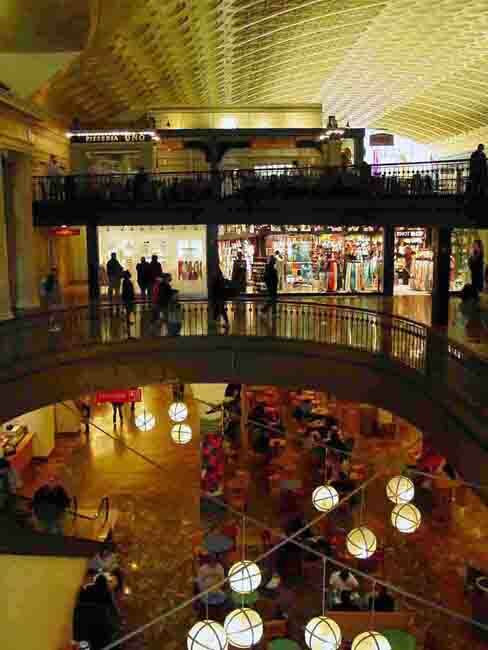 Retail sales at Union Station reached $70 million in 1995; more than 100 occupants reflect the retail specialty market that caters to working women. Rent is used for operating cost at the station - e.g. maintenance and security. Retailers must conform to strict design criteria: 85% of each storefront must be transparent; fluorescent and neon lighting are not permitted; signage is controlled; and building materials must be in keeping with the historic style of the architecture.